Lexus and Toyota dealers repeatedly rank the Japanese brands as the "most liked" in the industry, with an exceedingly loyal customer base, a top-line captive finance partner, "consistently high profitability" and strong blue sky values. Add a few palm trees and an ocean breeze, and it could be mistaken for Dealervana. So what's left to talk about during a make meeting Sunday morning? Plenty, it turns out. Lexus dealers, in the midst of a facilities upgrade program called Lexus Vision USA, had a flat sales year in 2018 — the brand sold 35,524 vehicles in the U.S., up just 63 units from a year earlier — and believe the Japanese luxury brand needs some even higher-end premium luxury vehicles. "We've got great product today, but in this type of market, we need to make sure that we're not only solving one part of the equation, which is sub-$50,000," says Carl Sewell III, the outgoing chairman of the Lexus National Dealer Council. "We've got to look for the future, in that more premium luxury utility-vehicle space." Meanwhile, Toyota dealers are facing uncharacteristic defections from one of the brand's most recognizable products, the Prius, to one of the industry's upstarts, Tesla. Toyota has an overall defection rate to other brands of about 9 percent, and about half of that is made up of Prius owners going to Tesla, according to Jim Lentz, CEO of Toyota Motor North America. 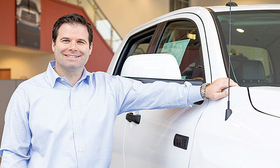 For Dan Abel, the chairman of the Toyota National Dealer Council, recent upgrades to the Prius, including adding optional all-wheel drive and making the Toyota Safety Sense suite standard, will help keep early-adopter consumers in the fold. "They like [technology] advancement, they like state-of-the-art," Abel said. "That vehicle has that, and those are things that draw customers to continue to purchase the vehicle. Then, you add in that new e-all-wheel-drive system, and it makes it even better." But for both Japanese brands, the immediate future may get tossed in unpredictable ways by forces outside the control of anyone in the industry, depending on how tariffs and other ongoing trade issues settle out.